Before purchasing a new Miele dishwasher it is a good idea to research. This way, you will take advantage of all new technologies available. In addition, the exercise will save you money by not investing in features that are not applicable for your use. We published this guide to help you select your shiny new Miele dishwasher with greatest certainty, in least amount of time. Miele consistently produces the highest quality dishwashers in the global market for decades. It is the only appliance manufacturer in the world which designs its products with 20 years of life-span in mind. You will notice the Miele quality from the moment you open its door, roll out the smooth gliding racks and position your dishes for optimum clean on its flexible interior racks. Miele ensures your dishes come out sparkling clean no matter what the soil condition was at the beginning. Miele engineering team not only designed an impeccable product suite but also innovated countless features that we all take for granted in our dishwashers (e.g. cutlery tray the 3rd rack, auto-open door, soil sensors and more). The company also prides itself with its legendary commitment to quality. This ultra conservative company still manages to fly slightly under the radar when it comes to marketing. You will not be able to find Miele products in home improvements stores as the manufacturer believes that its products should be sold by highly qualified sales professionals and reputable independent dealers. Appliance review publications usually do not review Miele products as they focus more on mass market products. In this buying guide, we’ll explore a bit of the history of the company before outlining the various features, designs, styles, traits and attributes of their dishwashers. Miele takes pride in remaining a family-owned corporation since its establishment in 1899, with a commitment to its owners and employers that’s every bit as strong as its commitment to its customers and users. Still headquartered in Germany but with a focus on the global market, Miele dishwashers are found in homes throughout the world. Their focus on sustainability has also made them a popular choice among environmentally-friendly customers, who admire the company’s membership in Global Impact, the UN’s sustainability organization, as well as Miele’s bi-annual sustainability report outlining their efforts to improve their sustainable credentials. The hallmark of Miele products has long been their high-quality builds and designs. This is more than just an arbitrary assessment. Miele utilizes one of the most stringent and exhaustive quality testing processes in the entire kitchen appliance industry. In order to guarantee quality, Miele carries out a wide range of tests. For example, they open dishwasher doors 100,000 times for each Miele model to guarantee supreme quality, smoothness of operation and long-lasting durability. This level of attention to detail has been carried over to all components of Miele's dishwashing technology. Miele testing specialists also run 7,500 washes for each dishwasher to guarantee that it will continue to operate at peak efficiency even after literally decades of frequent, active use. Energy conservation is also taken into account, with each Miele dishwasher being top tier Energy Star rated. Nearly every other dishwasher manufacturer in the market builds their dishwashers to last up to seven to ten years. This might seem like an impressive figure, but it pales in comparison to Miele’s standard of build quality. Each and every Miele dryer is designed and built to last 20 years. Miele is able to achieve this figure by ensuring that each and every element of their dishwashers is built to last. The racks and rack parts are designed to operate smoothly with minimal friction, the outer shell is built with solid materials whose quality you can feel simply by knocking on the outer surface and comparing it to that of other brands. The dishwasher doors are built perfectly balanced, meaning no level of undue stress is being placed on one side of the door or its springs and hinges. That adds up to long-lasting use without wearing and loss of operational smoothness. Because the dishwasher is a physically large home appliance, visual appeal is a critical element of design. For this reason, Miele has long stressed a commitment to designing dishwashers that are not only effective and durable, but also boast some of the most modern and artful design elements available on the market. Miele products generally come in three distinct finishes—black, white and clean touch steel. Clean touch steel is Miele's most advanced finish which results in a gorgeous steel surface that’s resistant to fingerprints and grease marks. This means that young children won’t be able to make quick work of a gleaming, clean dishwasher surface. Miele clean touch steel dishwashers will look brand new even in the messiest of home environments. This subtle yet critical design approach is just one sign of Miele’s understanding of the way that major appliances must not only be functional, but also fit into the aesthetic of the home in an effective way. A dishwasher is not a small feature, and as a result its visual appeal can be every bit as important as its effectiveness when washing dishes. Is a Miele Dishwasher Really Worth the Money? After all the info we’ve outlined in this guide, it may be worth asking—is a Miele dishwasher really worth the cost? All of these features are great, but do they add up to a truly revolutionary project that has the power to noticeably improve our dishwashing experience? In short, we believe that the answer is “yes.” Here are a few reasons why. Longevity - Miele dishwashers are built from the ground-up to last twice as long as any other dishwasher available on the market. We’re talking about the difference between ten years and up to twenty years of dependable use. Durability - That 20-year life span advertised by Miele doesn’t just represent how long you can use your dishwasher if you’re willing to run it into the ground—it represents a dishwasher that will operate at peak performance for two decades. That’s what truly sets Miele machines apart. Unparalleled Cleaning and Drying Performance - Miele machines use professional-grade pumps and industry-best drying systems in order to guarantee top-notch results, every cycle. Quiet Operation - Miele dishwashers are designed to be extremely quiet during operation. Unlike any other dishwasher, Miele machines are tested to remain whisper-soft even when the dishwasher racks are full and water is being sprayed and bouncing off plates, pots and pans. All of these advantages are tangible benefits of Miele dishwashers, but do they really make a Miele machine worth the price tag when you could feasibly find a working dishwasher for less than half the price? This is where the bigger picture comes into play. A Miele dishwasher is truly an investment in the future—with an appliance that’s an absolute delight to use, the mundane, everyday task of washing dishes becomes something better. It becomes a pleasure, something that’s streamlined, quick, straightforward and hassle-free. Minor improvements to your quality of life like this add up over time to noticeably make your days more pleasant, easygoing and happy. It’s very easy for your home appliances to be the most consistent and ongoing causes of stress in your life—isn’t it time that you invested in an appliance that actually reduces your level of stress, and can do so for the next two decades of your life? It’s this ability that we believe sets Miele dishwashers apart from all other machines in their category. Which Miele Dishwasher Should I Buy? Here are our top picks. We’ve selected and outlined three Miele standouts—the best all-around choice, the best value choice, and the absolute highest quality, most high-end product available in the Miele product line. This Miele masterpiece earns our top-pick thanks to its excellent blend of features for the price. It boasts all the Miele-specific bells and whistles you’ll love, including extra quiet operation at 40db and 9 wash programs with the ability to hold 16 place settings within its stainless steel interior. Built-in water softener with China and Crystal settings are additional luxury features, as well as an express cycle and half load cycle for smaller loads that can save you water and energy. This excellent model also features an AutoOpen door that opens at the completion of a wash and dry cycle. Boasting the lowest price tag of any current Miele model, this value option still packs a load of excellent Miele features including quiet operation, plenty of storage space and a visually appealing design. Plus, this budget beauty holds the distinction of being Miele’s most affordable dishwasher while featuring their unique, ultra-effective and convenient cutlery tray. If you truly want to experience the absolute pinnacle of dishwasher design, the Miele G6987 SCVi K2O EcoFlex Diamond Dishwasher with Knock2Open is as good as it gets. Besides an extensive list of all the best Miele features available in any of their dishwasher models, this stunningly designed masterpiece also features Miele’s patented Knock2Open functionality. Simply knock twice on the outer surface of the dishwasher to activate the motorized opening mechanism. This means no external buttons required, so there’s nothing to break up the visual appeal of this washer’s surface. The G6987 SCVi K2O also features interior illumination via Miele BrilliantLight technology as well as AutoClose functionality. The MaxiComfort basket design is top-of-the-line, and every element of this gorgeous piece of engineering is designed to wash dishes with flawless functionality, durability, dependability and style. If you want the best there is, you’ll find it in this Miele model. While it might seem like dishwasher size is a standardized measure, with no one company holding an advantage over another in the size department, the truth is that Miele has one distinct advantage in this case. Miele dishwashers come in both sizes compatible with standard American dishwasher manufacturer measurements—standard 24” size as well as the more compact 18” size that’s perfect for home bars, secondary kitchens or simply smaller kitchen spaces where space is at a premium. But Miele sizes are designed to European specifications, meaning that each full-size Miele dishwasher is actually approximately 23” and 9/16ths of an inch wide as opposed to the full 24”. This means that Miele dishwashers can fit into their appointed spaces more easily, smoothly, and with less “cramming” then other dishwasher manufacturers. Because home measurements are almost never exact, this can give you some extra wiggle-room in the event that the space appointed for your dishwasher is slightly smaller than what it ought to be. Some buyers express concern that Miele dishwashers will leave a gap between the dishwasher edge and the cabinet—Miele offers filler kits to allay such fears, though they are almost never necessary to achieve a snug, visually appealing look. When it comes to height, Miele might be considered to have the most flexible height range in the dishwasher market. Their products can be adjusted from 33 11/16” to 36 ¼”, allowing for easy installation beneath just about any countertop. Miele also offers an even shorter ADA model that can adjust down to 32 1/16”. One of the most common instances where this can be useful is in the case of homes that have had new floors installed directly over the top of old floors, raising the overall level of the floor and decreasing the distance from floor to cabinet top. One of the most critical elements of a great dishwasher is its control system. Miele offers a wide range of control options, some designed for maximum customizability while others are designed to be low-profile and minimalistic. Which dishwasher you choose will depend largely on where you fall in the balance between functionality and aesthetic. The good news is that Miele offers opportunities to have one without having to sacrifice much in the other. Fully Visible Control Panel - The most common and recognizable control panel types is the fully visible panel. This is a control panel that’s placed on the top-front of your dishwasher surface, allowing you to operate the dishwasher when its closed and offering all of the usual functionality including cycle types, special features, and start and stop buttons. These are often considered to be convenient and easy to use, providing an easily visible panel that can be accessed anytime. Fully Integrated Hidden Control Panel - Hidden control dishwashers are growing in popularity, offering much of the functionality of visible panels with a more aesthetically clean profile. In these designs, the controls are located along the top ridge of the dishwasher, hidden under the countertop when the dishwasher is closed. This offers the benefit of not disturbing or distracting from the Dishwasher’s visual appeal, with the minor disadvantage of requiring you to open your dishwasher slightly to be able to access the controls. While this might be bothersome to some users, most consider it to be an extremely minor inconvenience that allows for a major aesthetic upgrade. Integrated Custom Panel Dishwashers - Miele also boasts a leg up in the market of integrated dishwashers. Integrated dishwashers are models built to feature elements of the surrounding décor, blending with the kitchen finishes for a truly custom fit and look. Unfortunately, many integrated dishwasher manufacturers build models that are less-than-flush with their surrounding cabinets and table surfaces. Miele’s integrated dishwashers, however, can be customized to be 100% flush with the surrounding cabinets, resulting in a more desirable, high-end and undisturbed appearance. Knock2Open - For those who like even more aesthetic minimalism with a touch of highly-modern technology, Miele offers a truly distinctive design choice. Their knock-to-open dishwashers are an advanced line that feature no latches or buttons to open. Two quick knocks on the front of the dishwasher’s front activate the built-in door motor, opening the dishwasher automatically. Welcome to the future. This feature is only available on the Lumen and Diamond series dishwashers. The most important element of any dishwasher is the pump. This is the device that brings water into the dishwasher, gets that water where it needs to go, and drains the water once the dishwashing cycle is complete. A pump needs to be powerful, not only to ensure the success of each wash but also to guarantee the long-lasting life of your dishwasher. Poor pumps lose strength and break down more quickly, making your dishwasher unusable and requiring a replacement. Additionally, Miele is one of the only manufacturers to have a variable speed pump. This allows Miele to gently wash delicate dishes or powerfully scrub dirty dishes. Other dishwashers are either on or off which puts your delicate dishes at risk and produces less than ideal deep cleaning results. The most powerful pumps are usually found in commercial dishwashers, found in large restaurants, hotels, and other businesses that have the funds and the need for a high level of dishwashing that’s dependable over countless uses. Notice we said that the most powerful pumps are “usually” found in commercial dishwashers, because once again Miele has changed the game when it comes to home dishwasher pumps. They’ve taken the exact same high-end pumps that they’ve been using in their commercial dishwashers for years and placed them in each and every one of their home dishwasher models. That means your Miele dishwasher features industrial-strength cleaning power in each wash, designed to function at peak effectiveness for twenty years. Miele dishwashers are distinctive for many reasons, but one of their most impressive traits is their wide range of wash cycle options available even in the base models. Here is a quick rundown of the wash cycles available in Miele dishwashers. Normal: This standard wash cycle is designed for normal, everyday loads of mixed dishes that feature an average level of grime or soiling. Pots & Pans: Large cooking instruments often feature caked-on grease and dried grime, so this cycle is designed to provide an exhaustive clean for a like-new shine. Sani-Wash: Designed for users or dishes for which sanitation and hygiene are of the utmost importance, this cycle offers higher wash temperatures for helping to eradicate germs from items like baby bottles, cutting boards, utensils and other items. Express: Looking to complete a quick wash of lightly-used dishes? Use the express cycle to get dishes clean in a flash. Rinse & Hold: If you’ve loaded some dishes but aren’t quite ready for a full cycle yet, the Rinse & Hold cycle will quickly and efficiently rinse down waiting dishes to keep them from developing a smell or developing caked-on filth. China & Crystal (available in Crystal series dishwashers and above): Gently and fully clean and care for glassware that might be sensitive to high temperatures. This cycle requires only half of the average recommended detergent. Clean Machine: Every once in a while your Miele dishwasher might ned a good clean itself—this cycle is an energy efficient and effective method of cleaning the interior of your dishwasher. ExtraQuiet: Reduces the volume of the dishwasher’s operation by up to 20%, making it almost inaudible. Good for households with sleeping babies. Tall Items: A special program for cleaning extra large, heat-sensitive items like vases. You can even remove your top basket to allow for these larger items. Glasses: Cleans and dries beer glasses without rinse aid in order to guarantee perfect foaming. FlexiTimer/Delay Start: Set your dishwasher to begin and end at a specific time that you specify. Intensive: If the items in your lower basket require a deep clean, use the Intensive cycle to increase spray pressure while still providing gentle cleaning for the top rack. Soak: Some hard-to-clean residues require some soaking time. The soak feature helps remove these caked-on greases. For many years, all dishwashers used the same system of drying dishes—a built-in heater that would heat up dishes to the point that water would, in theory, evaporate off the surface of the dishes to make them dry. While this method has worked fine for some time, you’ve likely experienced the frustration of opening your dishwasher at the end of a cycle to find that the dishes are anything but dry. Miele has helped to lead the way in pioneering a new method of dish drying, one that’s proven to be more effective and uses less energy than conventional methods. It’s called condensation drying, and it uses science and a simple yet beautifully effective way to dry dishes. The last rinse of any dishwashing cycle usually uses hot water. Not only is hot water more effective at cleaning dishes, but it also evaporates more quickly once the dishwasher turns up the heat. However, if your dishwasher evaporates water from the surface of your dishes, then remains closed, that water usually has nowhere to go except…right back onto your cool dishes. But with Miele condensation drying dishwashers, cool air is circulated along the outside of an inner stainless steel tub that lines the interior of the dishwasher. Because water condenses on cool surfaces, and your dishes are still warm or hot from the rinse cycle, any evaporated water that condenses again will do so on the cooled, steel tub. This keeps your dishes nice and dry. Anyone who has had to leave dishes sitting in an open dishwasher, waiting for them to dry out, will appreciate the utility and convenience of condensation drying offered by Miele-made dishwashers. Everyone knows that the most cumbersome and time-consuming aspect of unloading a dishwasher is unpacking the cutlery basket. Stooping down over the bottom shelf, reaching down toward upturned knives and forks that poke at your hands as you try to wrestle them from the tangle of handles and disorganized cutlery. Meanwhile, the haphazard design of these cutlery trays mean that fine china and high-end dishware can be easily scratched on one another. Miele solved this problem with a surprisingly elegant and simple method—by adding a 3rd rack that serves as a separate cutlery tray. This try saves space within the dishwasher while also allowing you to separate and organize cutlery in a more defined and easily accessible way. It also means that each piece of silverware can be separated from the others, ensuring that no item comes out scratched or damaged by another. Since Miele first launched this design, other dishwasher manufacturers have tried to mimic its success—but none have offered the high level of cleaning results and seamless design offered by Miele creations. Another advantage of the Miele design is the full length spray arm that reaches each end of the cutlery tray for thorough cleaning. Certain Miele models even offer what they call the 3D cutlery tray, which accounts for larger utensils like ladles and spatulas to be cleaned on the top third rack. One of the other design elements that separate Miele dishwashers from the rest of the pack is their unparalleled dishwashing rack designs. Each Miele dishwasher is built to hold a truly astounding sixteen full place settings. The lower rack features taller side walls than any other dishwasher on the market, allowing for the safe storage and washing of larger plates and dishes. These tall side walls also feature specialized notches that keep delicate plates firmly in place for their safety. The lower rack of Miele dishwashers also features folding tines, which can be implemented for the sake of large pots and pans or other bulky items which can be difficult to place in other dishwashers. As if these features weren’t enough, Miele dishwashers also offer height-adjustable glass holders and special support rails along the lower basket to provide protection for glassware, particularly your finest glasses. When it comes to the upper rack, two folding shelves allow for mugs and similar small items to be held firmly and safely during cycles. These racks increase in configurability and customization options once you move up the Miele dishwasher model chain, offering additional racks and features that will delight and impress you. These distinct Miele dishwasher types also offer three distinct basket designs—Comfort Basket, ExtraComfort Basket, and MaxiComfort Basket. Comfort Basket: Miele’s standard-issue basket design is nonetheless an impressive mix of features, including a cutlery tray, basket handles, height-adjustable upper basket, fixed spikes on the upper basket for keeping dishes and cups upright, a MultiComfort area in the lower basket as well as two rows of stability spikes along the lower basket. MaxiComfort Basket: This top-of-the-line basket design boasts a truly outstanding list of high-end features, including stainless steel basket handles, height-adjustable support rails in the upper basket for glasses, a hinged row of support spikes with an XL cup rack that offers adjustable widge, two additional hinged support spike rows in the lower basket plus four height-adjustable glass holders, a hinged support rail in the lower basket as well as a hinged bottle holder. While the Comfort Basket offers more than enough features for the average user, the ExtraComfort and MaxiComfort Basket designs offer a true level of convenience and luxury not found in any other dishwasher from any other manufacturer. There are five unique series of Miele dishwashers, each offering their own sets of features and approaches to dishwashing mean to serve unique needs and user preferences. Below we’ve outlined the primary features of each series, as well as their most distinctive differences. Miele Futura Classic Plus: Miele’s entry-level series, which already makes it worlds beyond most entry-level dishwashers from other manufacturers and designers. It includes all the standard Miele features, including their standard cutlery tray design and an impressively quiet 46db operating noise level. Miele Futura Crystal: Keeps all of the features of the Classic Plus series, while adding an upgraded 3D cutlery tray, unique China and Crystal cycles for washing your most delicate dishes, additional configurable FlexiCare Plus baskets, a built-in water softening system and patented Sensor Dry functionality. The Miele Futura Crystal series is also 1db quieter than its Classic cousins, with an operating noise level of 45db. Miele Futura Dimension: Even quieter than the Crystal series with an operating noise level of 44db, the Futura Dimension series boasts all of the functionality of the Crystal and Classic collections while adding even more high-end features like auto-open drying, which automatically opens the dishwasher door at the conclusion of a cycle in order to aid and speed-up drying. It also features even more configurable FlexiCare Premium baskets, an even higher-quality design than those found in the Futura Crystal series. Miele Futura Lumen: This series offers everything that’s available within the Futura Dimension series, somehow managing to operate even more quietly at a truly whisper-like 42db. But perhaps the most distinctive feature of the Lumen series is its brilliant interior lighting, bathing all of your dishes in a bright glow so that you can see what you’re doing clearly when loading, unloading, and ensuring that your dishes are fully cleaned. Miele Futura Diamond: The flagship series of the Miele dishwashers, offering the absolute peak of high-end design and features, the Futura Diamond series of course features everything that makes the Lumen series so great, plus a little extra. Or should we say a lot extra—the Diamond series offers an AutoClose function that automatically shuts the dishwasher for you, plus Miele’s landmark SensorWash system for unprecedented wash cycle effectiveness. And it’s all protected by an extensive and exhaustive 5-year warranty for protecting your investment. The only person that can determine which series will provide the dishwasher that’s perfect for you and your home is you, but the best thing about Miele is that you truly do get more for your money. The Futura Classic series offers genuinely high-quality dishwashers, but for each step up you take in series and price you’ll be receiving genuinely valuable and impactful extra features that will be well worth the additional investment. Consider your own unique dishwashing needs before choosing the series that’s right for you. We’ve touched on some of the unique features of Miele dishwashers, but what exactly does Miele do that no one else on the planet does? Double-waterproof System: This unparalleled design means that Miele can completely guarantee that your dishwasher won’t leak onto your floors, providing priceless piece of mind that means you won’t feel the need to wait around and pace the kitchen whenever you’re running a wash cycle. Three Full-Function Spray Arms: Miele is the only dishwasher manufacturer that includes a true, full spray arm that covers the entirety of the cutlery tray for a thorough, extensive clean—every single time. AutoOpen Drying: One problem that plagues many dishwashers is that they can’t dry properly or stay dry due to condensation. Miele Dimension, Lumen and Diamond series dishwashers solve this problem with the ability to open automatically at the end of a cycle, to allow hot air to vent and allow dishes to stay dry. AutoClose: Like AutoOpen, the Miele AutoClose feature is available on certain models and allows you the convenience of not worrying about whether you closed your dishwasher before a cycle. AutoSensor: One of the most revolutionary elements of Miele dishwashers, the AutoSensor feature detects how soiled or dirty dishes actually are in order to automatically adjust the cycle to ensure clean dishes while providing energy savings by not running needlessly once dishes are clean. These reports also tend to rate dishwashers with heating elements more highly than those that use condensation drying, since condensation drying is a relatively new approach in the world of dishwashing. For these reasons, Miele can sometimes fly under the radar despite its supreme durability, design, features, service, and functionality. Once you’ve brought home a Miele dishwasher, you’ll want to make it last for as long as possible so that you can continue to enjoy the unprecedented level of convenience and design it offers. There are some easy ways to ensure effective and safe operation that will extend the life of your dishwasher so that it never stops impressing you. Ensure that your dishwasher is level when installed. This is vital for proper drainage. Take care to ensure that the drain hose doesn’t develop any kinks once the dishwasher is pushed back into place during installation. Check that the water pressure in your home is in the suitable range for operation of your dishwasher. Without the proper level of water pressure, your Miele dishwasher may not be able to function at peak effectiveness. Use RinseAid often to achieve the best drying results and keep your dishwasher operating at full efficiency. All Miele dishwashers feature an indicator light that tell you when it’s time to refill the RinseAid receptacle. If your area or home uses hard water, make sure you add salt to your Miele dishwasher’s built-in water softener. This feature is available in all Crystal, Dimension, Lumen and Diamond series Miele dishwashers. If you follow these tips, you should be able to guarantee optimal and long-lasting operation of your Miele dishwasher for decades to come. 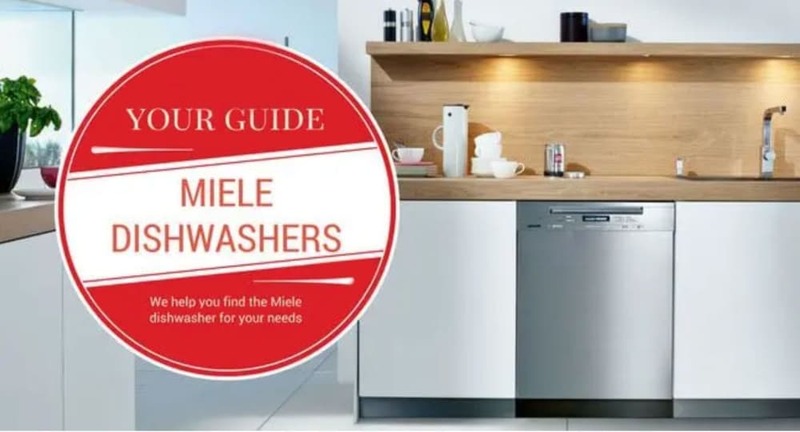 We hope this Miele buying guide has been a comprehensive, helpful overview of what you can expect when shopping for and using a Miele dishwasher. At Designer Appliances we offer the best prices on high-quality appliances. And with nationwide shipping, our top quality appliances can be set up in your home in a matter of days—no matter where you live. If you find that you still have questions, our help line is always open and our website is always online. Our blog is filled with appliance tips from certified experts, and our entire line of products is available for comparing and, let’s be honest, drooling over. Get a Miele dishwasher today at Designer Appliances!